If you’ve been a fan of Have Fun Teaching for a while, you have heard the term “hearting”. If you create an account with Have Fun Teaching, you can “heart” your favorite resources to save for later! As the new school year is just around the corner, we want to help you prepare for what’s to come. 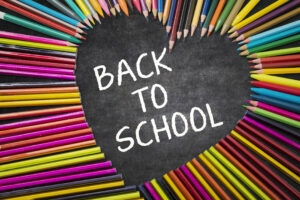 Here are six back to school resources that you can “heart” for later use! Bookmarks that students can color and personalize help make reading more fun! Once they are colored, teachers can laminate the bookmarks for longer use. Also, what child doesn’t love Dr. Seuss?! Be sure to “heart” this resource for later use! Using our Ellison style die-cut paper cut-outs, you can put the finishing touches on your back to school bulletin board. Use the robot and light bulb together for an electricity themed board. The sun cut-out would be great partnered up with the donut cut-outs decorated by yourself or the students! In addition to more die-cuts, you will find fun decorations for your classroom in this resource. Create your own puzzle with names and birthdates of your students to hang on the wall. Design your own hall pass for when students need to use the bathroom. Decorating can be fun and helpful to your students! Teachers and students alike benefit from having name tags on the desk before open house. Familiarizing students with where they will be sitting can prepare them for what’s to come. Using these name tags, you can personalize the tags according to student interest, season, or lesson plan! It is important for teachers to know information about each of their students. Many children have allergies or special transportation information that parents need to provide. Teachers should also know fun information about each of their students. You can find “About Me” worksheets here, as well! Teachers should have standards set from the beginning as to how they want their classroom to work. Here, you can find a classroom rules form that helps you set those standards. Each of these resources has the potential to benefit you in the new school year. Be sure to “Heart” the resources you like so that they are ready for you when the time comes. You can also follow our Pinterest account for more fun! Always remember to Have Fun Teaching!